Hate this thing. As if OTT wasn’t already bad enough. 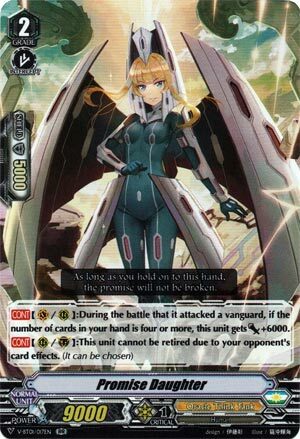 So Blaster Blade and no Kagero card can retire it except through attacking it, and it scales with 8k boosters to make 23k and thus hit magic numbers as well as Royals and Kagero can. Still not entirely problem resistant as it can still be paralyzed by Megacolony if you’re playing that format, or it can be Vanquisher’d away because retiring for that deck is not a condition to bind. 4-of. Too good not to play in Standard. Previous articleYu-Gi-Oh! Hidden Summoners Coming This Fall!